Today, more than ever, we need a Community Advocate who tells the truth and cares more about the people than the special interests and the city union bosses who pull the strings of our council members. 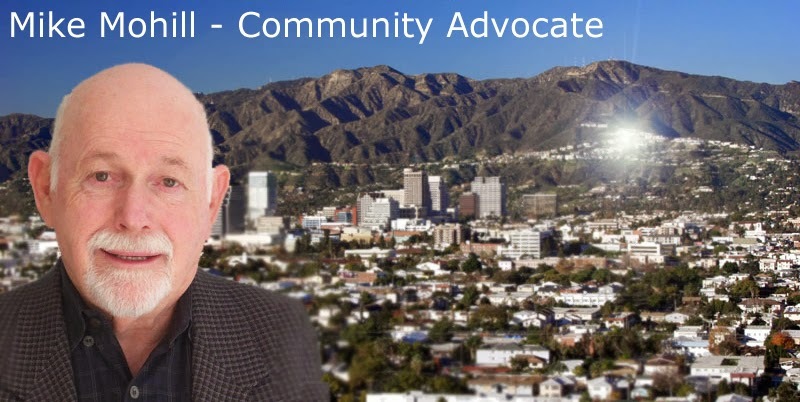 Mike is a founding member of GLENDALE COALITION FOR BETTER GOVERNMENT. WEEK OF 9/29/15 ACCOUNTABILITY: HOW DO YOU SPELL IT? Dear Friends, GOVERNMENT GRANTS are great!! But should not be the only or primary source to fund needed city services. Grant Funding for Palmer Park was approved by council Tuesday night. About 18 years ago, 30% of the General Fund was required to pay the salary and pensions of our fire and police personnel. Today, 80% is required and still growing to pay for our safety personnel, leaving virtually no money left in the General Fund to pay for needed city services. Every day, more money from the city coffers are being diverted from other departments to pay the $1.4 BILLION in unfunded pension debt plus another unfunded $226 MILLION for a "Cadillac" Post Employee Health plan for only current retired employees, who retire at age 50 or 55. Councilwoman Friedman stated Nibley Park and Brand Park were both very clean and maintained parks, but I guess she has never spent time at Heritage Park or other parks in south Glendale. Having received through the years thousands of dollars in campaign money from our city unions, she stated unions help make the middle class. Gee, what non-government union employee can retire at the ripe old age or 50 or 55 and have the taxpayers guaranteeing pension investments and the employees receiving 90%, 75%, 60% of their last year salary as their pension FOR LIFE? Mr. Najarian is right that grants HELP build our cities, but cities who have millions of dollars of unfunded pensions and unfunded post employee "Cadillac" health care debt rely on federal, state and county grants as their sole source of funding. With millions of dollars in unfunded debt obligations why are our council members authorizing spending thousands of dollars of staff time for the "pie in the sky" 134 Park, located between Pacific - Glendale Ave over the 134 Fwy.? Oh, council is counting on GRANT FUNDING and private donations...believe that and I will sell you an Iceberg. .. it's only other people's money. PS... The Rockhaven Sanitarian could use a few million dollars in grant funding too, as long as we are talking about "pie in the sky" ideas. Former Councilman, Dave Weaver, loved to tell the public that Council members must be doing a great job, because few people bother to come before Council and express their displeasure. Please sign the non-partisan Utility User Tax petition being circulated around our city in order to repeal this tax and tell our elected officials we no longer want the status quo. Please contact Bill Taliaferro at 818 395 9414 to sign the petition. If you care to view my YOU TUBE CHANNEL, please CLICK the links below. Your comments are always welcome. Please share my videos with others. Should you like to receive automatic updates, please subscribe. WEEK OF 9/15/15. PUBLIC MONEY HAS NO SHAME! GLENDALE PENSIONS took center stage and councilwoman Freidman and City Manager Ochoa continue to say they are fiscally responsible. Ochoa will tell the public we do NOT have $1.4 Billion in unfunded pension obligations. Ochoa said our unfunded pension debt was ONLY about $400 million. As usual, Ochoa and Friedman try to mislead the public. Actually, the $400 million represents only the already retired city employees pension debt. The larger unfunded pension debt for our children to pay is the $1.4 Billion for the approximately 1300 current city employees. Also, not mentioned by Ochoa or Freidman is the over $225 million in "Cadillac" post employee health insurance benefits for current retired employees. DANGEROUS HANGING BALCONIES PUT GLENDALE TAXPAYERS AT LEGAL RISK! Mayor Najarian misleads the public when showing two 16 story buildings. Mrs. Friedman, developers favorite council person. Marc Nathanson and others giver her campaign money for her help. Donald Trump states he give money to everyone and looks for payback in the future.